A Church source in Egypt has told a Catholic charity that extremist Islamists are carrying out daily atrocities against Christians – including kidnapping and murder. The source, who asked to remain anonymous for security reasons, told international charity Aid to the Church in Need: “There are many extremists Muslims who commit horrific acts every day – every day we hear about another Christian being murdered”. Al Saed is a region in southern Egypt, covering the south of Cairo, the Suez Canal area and the Sinai Peninsula. Four Christians had their throats cut by extremists within a ten-day period in January 2017. Gamal Sami Guiguis and Nadia Amin Guirguis had their throats slit in their beds on the 6 January and two days earlier a merchant, Youssef Lamaei had his throat slit by a Salafist extremist outside his shop. A fourth victim, Dr Bassam Safouat Zaki, was killed in his own apartment. He suffered multiple stab wounds to chest and throat. The source told ACN that a Christian from Ismailia, Egypt was kidnapped six months ago and that the extremists had demanded substantial ransom amounts for his return. There is still no update on the victim’s whereabouts. The source also warned of an underground extremist threat in the country. He said: “There are also some people called the sleeping cells. “These are the people who look law abiding on the outside, but when they have a chance they will wake up and be more [violent] than the extremists themselves”. 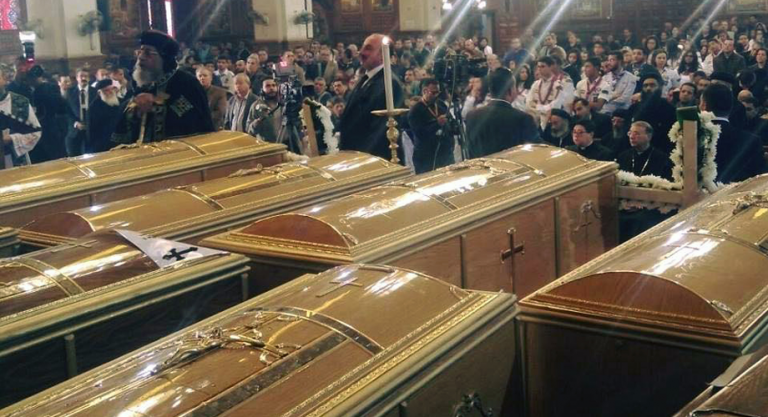 But the Daesh (ISIS) suicide bomb attack at St Peter and St Paul Coptic Orthodox Church on the 11 December 2016 that killed 26 people including six children and injured dozens is galvanising Egyptian and international support for Christians. Coptic Catholic Bishop Kyrillos William spoke to ACN following the December attack: “We are very upset. It was only on Tuesday [20 December 2016] that the Coptic Church received the twentysixth martyr of the latest attack, a ten-year-old girl who had died of her injuries. Bishop William also confirmed an improved security response by Egyptian authorities since this bomb attack and thanked all those who had shown “solidarity and sympathy”. ACN is helping Christians in Egypt build churches, educate priests and provide pastoral care to young people.